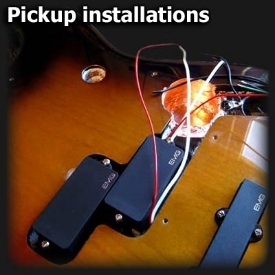 Pickup installations, custom wiring mods & more. We cover every aspect of guitar electronics! 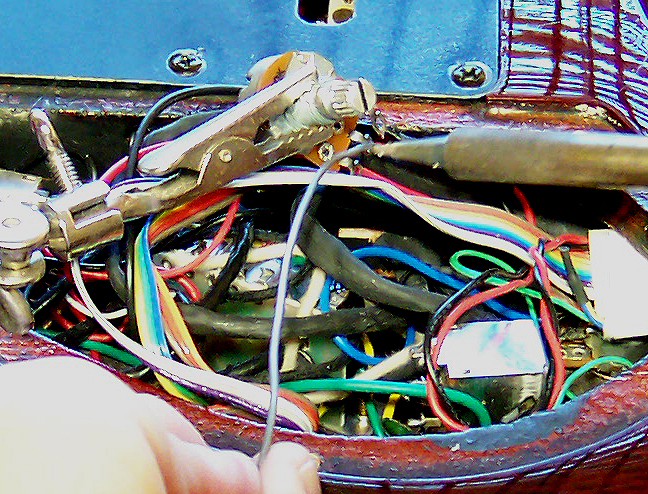 Guitarlodge cover the whole spectrum when it comes to guitar electronics, including pickup installations, custom-wiring modifications, troubleshooting circuit faults, guitar re-wiring, guitar shielding, component replacements & more. Our technical & product knowledge has evolved through years of listening to guitarists/bass players & their requirements. We always take note of customer feedback on pickups we have installed & with so many manufacturers constantly releasing new products, this information has proved invaluable on many occasions. We fit lots of components on many guitars with pickup installations being the most popular, although that’s just one of the many guitar electronics services available at our repair centres. All our guitar electronic parts (supplied by us) are of the highest standards & guaranteed (please see terms & conditions at bottom of page). Case studies & pictures can be viewed on our gallery page. Please contact us for installation of pickups, electronic repairs & modifications to your instrument. If via email please include your instrument make & model along with a detailed description (web-link) of parts to be installed (if applicable). It is not always possible to give a set price on this type of work, but please feel free to ask us for a no-obligation quote. Better still, pop into our repair centre where we can discuss your installation needs. Pickup Installations that require routing or cutting of the guitar body or additional screening for example, will incur extra labour charges on top of our guide prices. Please see prices page for details. Replacing electronic parts on guitars covers a wide spectrum, some parts being relatively straightforward to fit & others not so! For example we often take in archtop & hollow-body guitars in need of pot, pickup or switch changes. 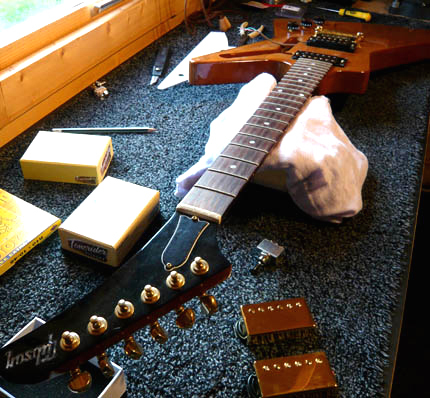 Electronic repairs on these guitars require great care & experience. We have seen many cases of damaged guitars that could have been avoided, if only care & advice had been taken. 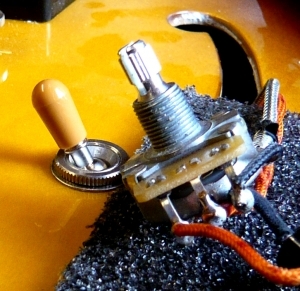 The list below includes our most commonly requested guitar electronic repairs & modifications. Replacement of Pots & switches: Noisy worn pots & selector switches can effect a guitars tone & volume before they eventually fail completely. Cleaning normally removes dust particles or other debris & can cure noisy components, but is often only a temporary fix. In many cases guitar components are replaced due to corrosion, wear, breakage or as part of an upgrade, as with new pickups, where the pots & switches may be supplied as part of a kit. Guitarlodge only use the best tried & tested components, making your guitar electronic repairs & installations cost effective & reliable. Re-wiring: Replacing old original guitar wiring when soldering in pots & switches rules out any possible circuit faults from frayed worn wire, & also makes for better connections. We regularly modify guitar/bass electronics to vintage-style circuits using heat resistant, high quality cloth-covered hook-up wire & vintage spec capacitors, for the sake of reliability & tone! Les Paul: Peter Green & Jimmy Page custom circuits & more! 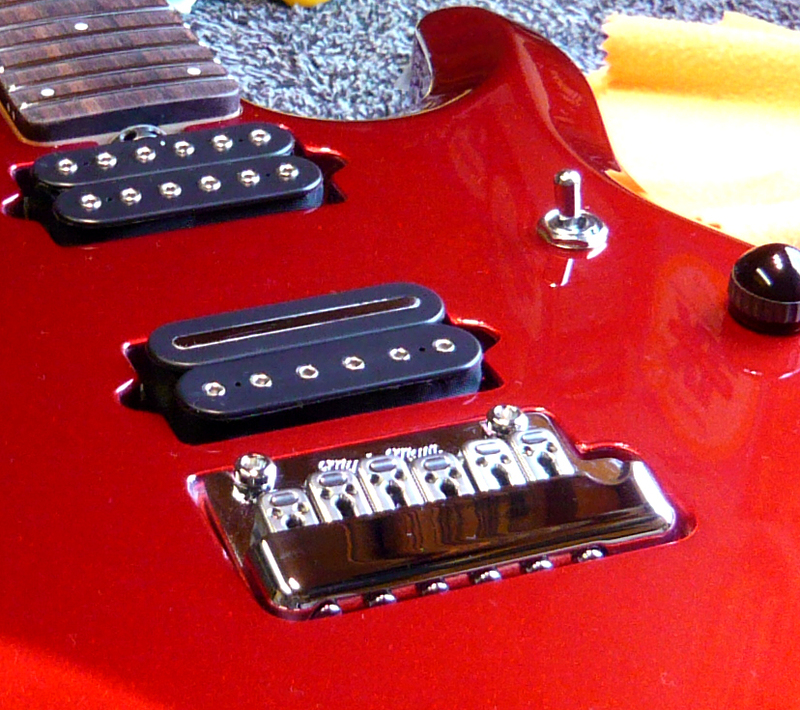 When it comes to guitar & bass modifications, changing pickups is right up there at top of the list! Guitarlodge have years of experience in guitar & bass pickup installations & can advise on important factors like compatibility & brand. Expensive is not always best, we install a variety of quality lower budget pickups along with well known names such as Seymour Duncan, Dimarzio, Bare Knuckle, EMG, Fender, Gibson, Lindy Fralin & many more! It’s a tone thing! Guitarists & bass players upgrade their pickups for many reasons, although tone & noise-free operation are the normal priorities! Some install a favoured brand or combination into several instruments, whilst others just like to experiment finding out which tone characteristics suit them. The replacement of poor quality stock pickups on guitars is standard practice these days due to common inherent problems, including uncontrollable feedback at higher volume levels, mains hum, nasty-thin sounding tone with no punch or bass response. At Guitarlodge we have fitted & listened to al-sorts of guitar & bass pickups including many of the acclaimed brands, on countless instruments – its safe to say we know our stuff when it comes to pickups! 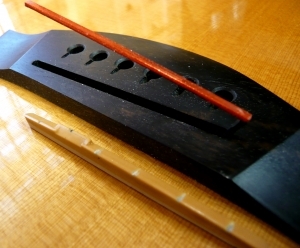 Classic pickup combinations: We are often responding to emails concerning pickup suitability in certain body-wood types, brand & model preferences etc! On-line forums are invaluable when choosing pickups with so many opinions available. However although sound-clips are readily available for most of these pickups, they seldom represent the true tone due to so many obvious variables. We have a shortlist of the ten most popular pickups we install on a regular basis. It might help you decide on your next upgrade? It’ll come as no surprise that most of these pickups are tried, tested & favoured the world over! 1. Seymour Duncan JB & 59 The bench-mark! Versatile medium output humbucker set. Jazz/rock. 2. Bare Knuckle Warpig Metal styles. High output humbucker with interesting cover plate options. 3. Fender Texas special (Strat) Single coiled set of 3. Great classic strat tone, but more punch! 4. Iron Gear Steel Twin II Telecaster high output combo with some great coil splitting options! 5. Dimarzio Air Norton & Tone Zone Medium output for jazz/rock. (Tone zone in bridge position). 6. Lindy Fralin (Bass) One of the best Fender P bass upgrades. Clear tones with bags of punch! 7. Bare Knuckle Riff Raff & Mule Medium output jazz/rock combo. 335s/Les Pauls (Mule in neck). 8. Iron Gear Blues Engine Medium output humbucker. Incredible price & killer tone. Plus its British! 9. EMG 81/85 The classic metal duo as used by Zakk Wylde. Beware these actives are extremely hot! 10. Seymour Duncan Slash set Medium output with warm tone. Not just for Les Pauls! Jazz/rock. Routing: Certain guitar pickup installations require routing-cutting of the guitar body & additional shielding, others are a straight swap but may include some wiring mods as part of the upgrade (see above). Additional routing of battery cavities is often required during active pickup installations, especially where guitar control cavity space is an issue. We have all the necessary equipment & experience to install pretty much any guitar/bass pickup set or kit. 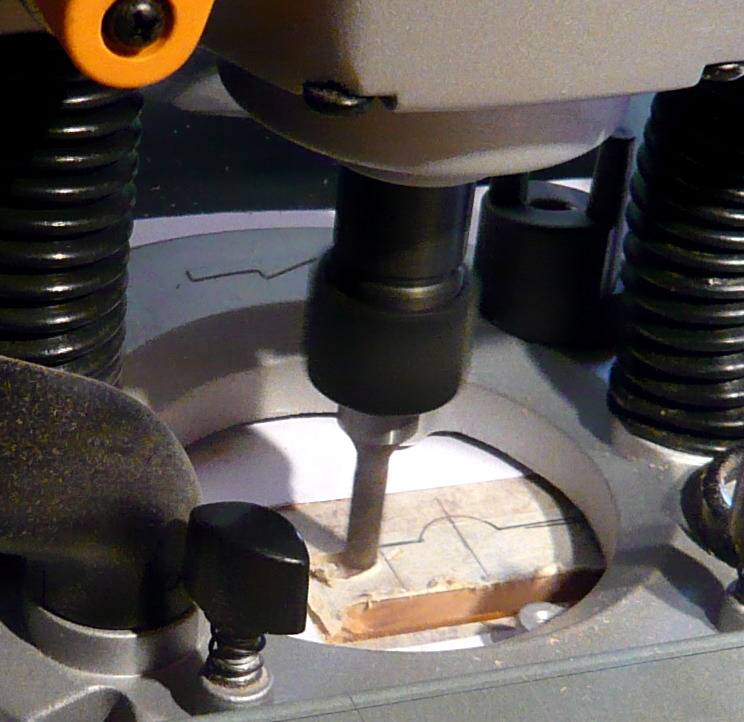 Touching-in of the surrounding finish (after routing work) can become necessary when installing (direct mounted) types of guitar pickup. Mount types: We can supply & fit replacement guitar/bass scratch-plates & pickup mounting gear for most manufacturers including: Fender, Ibanez, Jackson, Ernie Ball, ESP, BC Rich, & more. Please ask for details. Piezo bridge installations: Many guitar players are discovering the tonal advantages of the Piezo-equipped bridge, as fitted on certain guitars like the Ernie Ball Musicman JP6 (Petrucci) model for example. The acoustic-guitar like tones produced from these units add another dimension in sound to electric guitars. Various brands & styles are available to suit most guitars. Popular-reputable makes we install include: Fishman, LR Baggs & Schaller amongst others. Twin jack socket (optional XLR) plates & modifications to guitar electronics are required on Piezo installations. Other options available on certain models include on-board preamps for improved guitar pickup blending & EQ control. Transducer & preamp installations: There are plenty of good quality systems out there nowadays for those considering ‘going electric’ with an acoustic guitar preamp. Many devices are fairly straightforward to install, some can be more involved. We fit lots of acoustic guitar preamp-pickup systems to various brands & can advise on which type will best suit your needs & not stretch your budget! We recommend Installation of under-saddle transducer preamp systems be combined with a set-up, this ensures correct action at the bridge & balanced output across all strings. Replacing under saddle transducers: Replacement guitar transducers vary in size & construction, some are more reliable than others! Guitarlodge can advise on which brands & types best suit your instrument. If they’re faulty, damaged or incorrectly installed, these delicate guitar pickups can give several problems including poor output balance between strings, dull tone, electrical hum, popping-banging during use, output level variations, slight over-driven or distorted output. We recommend replacement of acoustic guitar transducers be combined with a set-up (see section above). Your guarantee: We always guarantee our workmanship on electronic modifications for a period of 6 months against component failure & bad connections. This only applies to the work we have carried out & parts supplied by us. It does not cover string breakages, damage due to misuse or rough handling etc. Electronic installations combined with set-ups are also covered under our guitar & bass set-up guarantee. Turnover times: Time-scales can vary depending on availability of parts, & other work that may be required. We will contact you if we are unable to meet an agreed turnover time.